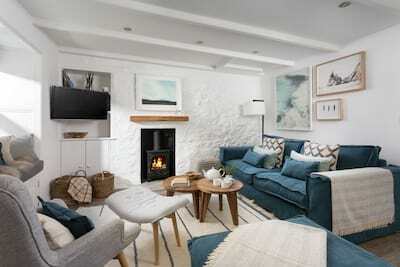 A popular choice within the Cornish Gems portfolio, Kerensa is a chic and stylish home created in the style of a traditional Cornish granite cottage. 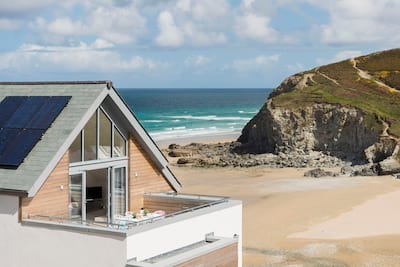 Whether family beach days or friends looking to explore Cornwall's hot spots, this enviably located holiday home offers the perfect base with luxury in mind. Kerensa has received a VisitEngland 4 star Gold Quality Assessment award. A great sense of space and relaxation ooze from every room, the sunny open plan living space is smartly presented with stylish Scandinavian inspired furniture with ample seating for up to six guests to relax and catch up. The cosy effect fire makes Kerensa as suited to a winter stay as a summer. 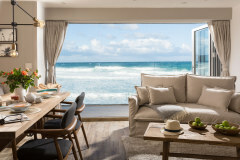 Superb attention to detail ensures a real homely feel, every cushion, cup and curtain has been handpicked by the owner to complement the relaxed style of your holiday home. Three lovely bedrooms offer a peaceful haven in which to retire. 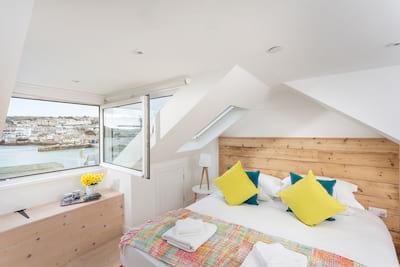 A ship shape patio with seating enough for six to dine comfortably, if time out from the collection of fine restaurants in nearby St Ives is needed then enjoy a home cooked meal al fresco. Dogs are welcome to join in the holiday vibe, the terrace offering a safe haven for them. 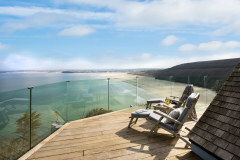 This fabulous property is adjacent to the Hayle Estuary a well renowned RSPB nature reserve and offers great accessibility to the plethora of golden sandy beaches and attractions that West Cornwall has to offer. The frequent branch line train is only 5 minutes walk away and arrives in St Ives in 8 minutes, offering some breathtaking coastal views along the way. Excellent Property, great location and a very comfortable stay. Customer service was great. Thank you. 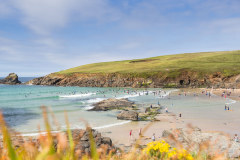 Your team are always very friendly and helpful, always recommend Cornish Gems to friends who I know book with you. Always lovely to arrive and make tea and cake with the provisions you provide, just like arriving at friends and family homes. Really appreciate the gifts, and more provided this year. 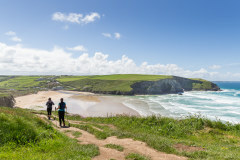 I am extremely fussy when it comes to cleanliness, that's why I will only book a holiday with Cornish Gems, the properties are always spotless. We always leave it as we found it. Wonderful that Kerensa had been updated, I did wonder as we had stayed there in 2013, and I thought it might have been a little used. The updates were beautiful. A wonderful well equipped property with everything we could have wished for. Also in a great location. Always professional, friendly and helpful. Wonderful welcome treat Very helpful. Kerensa was perfectly clean and welcoming. Home from home. 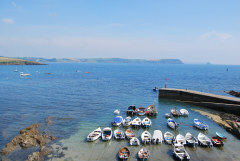 Kerensa is in an ideal location & the cottage itself is very well equipped. We really enjoyed our holiday. Fantastic property. 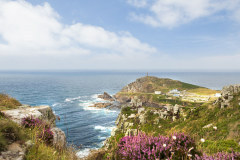 As others have said it is a proper home away from home really well placed for visiting that part of Cornwall. A very well appointed property, comfortably furnished and in a great location. 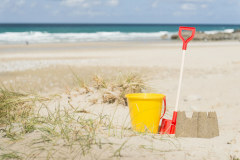 Just 100 yards from a little train to take you to st Ives it was a perfect family get away for my family and friends. Very welcoming feel to the property and very clean, very well resourced. A good holiday had by all! Very Good property, comfortable stay. Convenient location. We had a wonderful week at Kerensa. 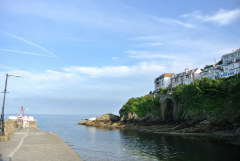 It was perfectly positioned to reach St Ives by train and to explore West Cornwall by car. The house was modern and immaculate. Staying at Kerensa was a pleasure. 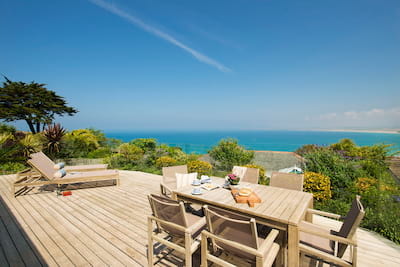 This is the second time we have booked with Cornish Gems and again we found the property to a very high standard, also the WIFI was excellent, the welcome gift was very much appreciated and was delicious - the location of properties on Saltings Reach are in a ideal position for visiting St Ives and the lovely countryside & coast nearby. An excellent stay as always. Very nice property to stay at, well equipped and very clean. Location was also very good to have as our base. 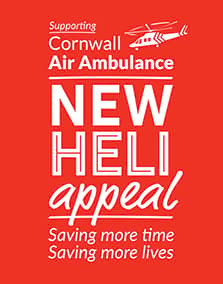 Would definitely rebook with Cornish Gems again whenever I visit Cornwall. We enjoyed our week immensely and the tea/coffee in the Cornish Gems Coffee Lounge in St. Ives was very good (friendly welcome too). Great location. Comfortable house, clean and well-maintained. Would recommend. We had a lovely holiday at Kerensa. The property was well situated and had everything we needed. Would definitely recommend to family and friends. We found the property to be really well equipped and finished to a good standard; great location, and the telephone support from your office was absolutely superb. Thank you very much. It was a lovely property, really well located and cared for. Our stay at Kerensa was delightful. The house was furnished to a very good standard; simple and contemporary. The kitchen/diner was particularly impressive. The house is superbly located next to the train station and with a wonderful pub close by. A perfect place for a large family to stay. Ideally situated to explore everywhere and had a lovely holiday. Thank you.